Who cares if April brings showers? It’s also bringing Hillary B. Smith back to General Hospital! The Emmy-winning actress is going to reprise her One Life to Live role of ace attorney Nora Buchanan starting early next week for some episodes that will air throughout the month. This time, Nora’s helping out Kevin Collins (Jon Lindstrom), who is in a bit of a jam since he kept secret the fact that his serial killer twin Ryan (also Lindstrom) was still alive. Smith last appeared on GH in 2017 and the actress stays very busy in between the times she dons Nora’s legal hat. She has a role in the film 1 Million Happy Nows (available on Amazon Prime and iTunes), which stars Crystal Chappell (ex-Carly, Days of Our Lives) as a soap star afflicted with early onset Alzheimer’s disease. The fan favorite is also very active in the web series scene, appearing as Guya on Venice and as herself in IT Girls On A Stoop. Also, Smith served as a Supervising Producer on Beacon Hill. 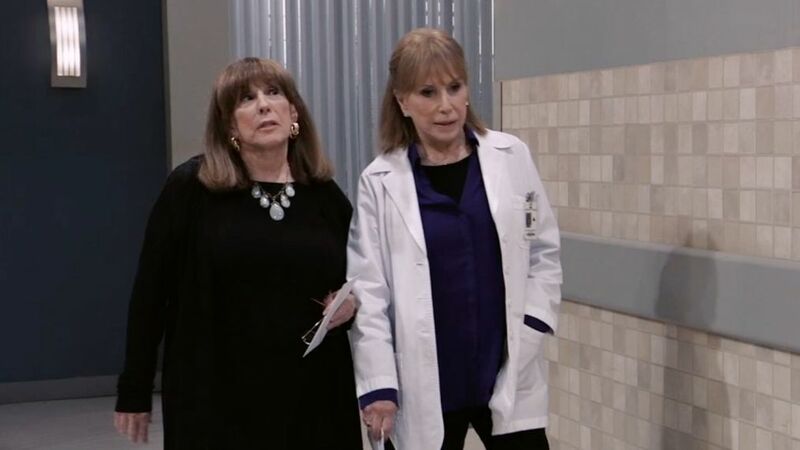 TV Insider recently chatted with the delightful Smith about Nora, web soaps, which role she’s spotted for the most often, beloved late soap writer Douglas Marland (As the World Turns), and more! After three years as angsty priest-turned-neurosurgeon Dr. Griffin Munro, Cohen is checking out of the ABC soap. It’s great that GH reaches out to you when the show needs a lawyer for a storyline! Hillary B. Smith: I’m always so honored when I get the call from Frank [Valentini, executive producer] asking me if I’d come back onto the show as Nora. I said yes, it sounds like fun if the dates work out, which they did. It’s always a blast. It’s fun to come in and catch up with old ‘classmates’ like Maura West (Ava; ex-Carly, ATWT). I hadn’t seen her in eons since before she married Scotty (DeFreitas). I worked with him on As the World Turns [where he played Andy] before he was…you know, a man! In Llanview, Nora would defend friends and family, people with whom she has intimate, on-going relationships with. What’s it like to represent people she doesn’t know as well? I don’t really know anybody. That’s the beauty of it. I come in a with a clean slate and I love that. When you’re on a soap opera for as many years as I was as Nora on One Life to Live you can become ‘burdened’ with a lot of [other characters’] history and how you feel about certain characters because it’s part of your history. I come here with ‘everybody’s entitled to a good defense’ and a clean slate. I get to play with people nobody else will touch. It’s kind of fun. Viewers may see it as ‘If Nora believes in this person, then I can, too.’ That’s how I see it. Oh! Yeah. Well that’s nice. Thank you! What’s up with the next season of Venice? Season 6 of Venice is going to start shooting in May. It’s a fun tip of the hat to the Guiding Light fans. We’re going back to New Jersey and the park [where the show shot] and there will be some wonderful guest stars in Venice’s sixth season. It’s going to be a wonderful season. Web series have been around a while; how have you seen them change in terms of getting audiences to be as passionate as they are about broadcast soaps? How have they learned to monetize? I think Crystal [Chappell, creator, Venice; ex-Carly, Days of Our Lives] forged the way and she did it smartly with the faces that people love to see. There was a built-in audience for that and so there was a built-in revenue, too. It’s the familiar faces that started and launched Venice. This coming season, Crystal and I will be co-directing, which will be a really fun venture. When you tell a story from a book or in a play, you’re laying out your story and it’s up to the audience to decide where they look, what they hear, and who they relate to. When you tell a story on film or in a Web series, you point a camera and you have the audience watch the story you’re telling. It’s making sure the audience is seeing the story the way you need them to see it. What’s next with It Girls On The Stoop? We’ve had two seasons and I think we’re going to do a third, which will be a hybrid of the first two. We’ll go back to the funny, crazy, first season, and blend it with the more sedate second season. I love the second season. It was a completely different take. We did the cooking, but it was really about thinking and talking about what it means to be a woman and talking to different generations. It was about taking care of yourself. Now we’re looking at a blend of the two and looking probably at a different venue. Who are you in touch with from daytime? 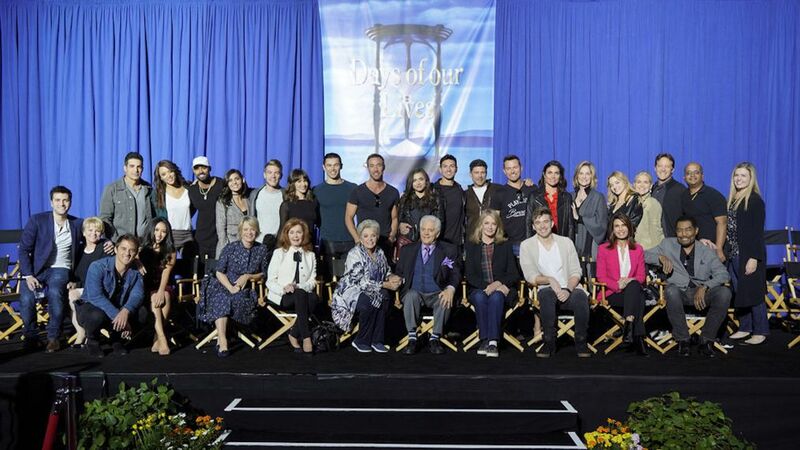 I just reached out to Kassie [DePaiva, Eve, Days of our Lives; ex-Blair, OLTL] and to Beth Maitland [Traci, The Young and the Restless] to congratulate them on their Emmy nominations. Beth is a longtime, dear friend of mine. I’m so pleased she’s been given the nod this year. She does just such beautiful, incredible work. I’m thrilled for her and, of course, for Kassie, who is one of my buds on OLTL. We positioned our dressing rooms across from one another and we’d keep our doors open and chat. We were there for the reincarnation [of the show on The Online Network] and have been friends for almost 30 years. I also just spoke to ‘Woodsy’ [Bob Woods, ex-Bo, OLTL]. He’s doing great. I sent him a picture of us [from a recent magazine] that had a list of the top five couples from soap operas. It was GH’s Luke (Anthony Geary) and Laura (Genie Francis) and then Bo and Nora! I reached out to him and said, ‘Hey, I’m out here in Port Charles right now talking about you.’ He called me and we had a good giggle. When you’re out and about which character are you most spotted for and does it change based on what part of the country, you’re in? Yes, it changes. I get Margo [from ATWT]. I get Nora [from OLTL]. I get Guya [from Venice]. It’s very interesting. I’ll get Guya all over because we’ve been in people’s home around the world based on the digital aspect. Nora will be specific to where anyone could get an ABC channel. Margo is interesting because people will say, ‘Oh, my God! You were Margo!’ It’s been years and years ago [that I played her] but when they were growing up, their caretaker or grandmother had the show on. When they were older, taking care of their own kids, they had ABC on. It just depends. Margo pre-dated Nora, but she’s remembered so lovingly because Doug Marland [late ATWT head writer] created a town that people wanted to live in and families people wanted to be a part of. Yes. He created his own family is what he did. He wrote on a typewriter in a room off of his kitchen in Connecticut. Above the typewriter were all of our 8x10s including a picture of me and Phips, my son, who played [Margo’s] baby Adam. He wrote on his typewriter, a manual typewriter. He was the first pass on the script and he was the last pass. He had his family right there. That’s what he did. He loved everyone. His casts kept getting bigger and bigger because he didn’t want to lose anyone, but he loved adding new characters. You knew who his characters were and what their purpose on the canvas was. Doug was responsible for the brilliant behavioral twist that Barbara [played by Colleen Zenk] went through on As the World Turns. He made Barbara bad. She’d been the good girl and he found a way to turn her. I thought Colleen did fantastic work in that. Colleen embraced that change. Not all actors do. [Another case is when] Catherine Hickland (Lindsay) came on to OLTL and wasn’t sure she wanted to play bad. It was a leap of faith. I took her hand and said, ‘Are you ready? We’ll go there together and I won’t leave you out to hang.’ That was the beginning of Lindsay and Nora [and their feud]. You got to play Lindsay in a fantasy episode one year and do what Nora saw as her fake crying. Hilarious. That was [executive producer] Gary Tomlin’s genius of doing the fourth of July show and making it different. One year, we traded roles with one another, another a musical, another year we did live shows – it was very fun. Any other projects coming up in addition to these GH appearances? Yes. We have a wonderful shooting script for season two of Beacon Hill. I’d have to say it was my favorite. I got to see Scott Bryce (ex-Craig, ATWT) and work with a lot of fun people. It was really fun.